This year the Picnic was at Jeff Williamson's house in Bellville Michigan. 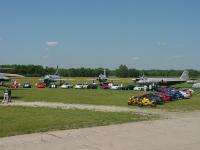 We all had a great time, The main event was a ride out to the local air museum. We got some really great short of our cars in front of some classic military hardware. A Special thanks to Bob Stirling, I forgot my camera and he let me use his for the day. "Thanks again Bob.